Turnberry is a small village situated about 16 miles south of Ayr. The lighthouse at Turnberry is built on the spot where there used to be a castle, believed to be where Scotland's most famous king, Robert the Bruce, was born. The Monument by the Lighthouse, is in honour of British, United States and Australian servicemen that lost their lives while at the Turnberry School of Aerial Gunnery & Fighting during the two World Wars. Turnberry Castle was one of the oldest buildings in Carrick, dating back as far as the 1100s. It was the seat of the ancient Earls of Carrick, one founded Crossraguel Abbey, and another, Robert the Bruce, became King of Scotland. It is unclear if Robert the Bruce was born at Turnberry Castle or at Loch Maben, but most historians believe he was born at Turnberry. 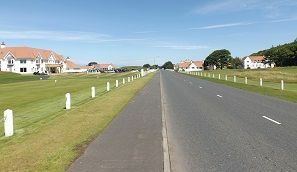 The golf course was laid out in 1901 by Troon professional Willie Fernie for Archibald Kennedy (3rd Marquess of Ailsa). The course was soon taken over by the Glasgow and South Western Railway, a company looking to set up the first golf resorts. 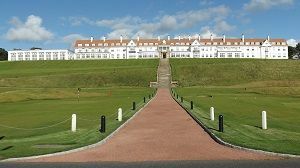 Turnberry Hotel opened in 1906 as the first golf resort of its kind. 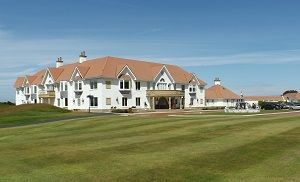 This golf resort is still regarded by many as the finest in Scotland. A light railway between Alloway, Turnberry and Girvan was completed in 1905, with the main purpose of carrying golfers from all over the UK to the resort. The rail line was closed in 1942. The architect James Miller designed the hotel on a plateau overlooking the golf course. 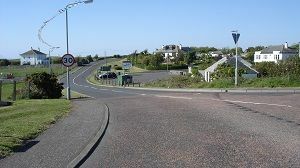 Right is a view of the A719 scenic coastal road 15 miles south of Ayr as it passes through Turnberry. Turnberry is a small village with a few old style luxury homes. The five star Turnberry Hotel offers fishing, shooting, archery, falconry, biking, horse riding, off roading in 4by4s, hill walking and much more. 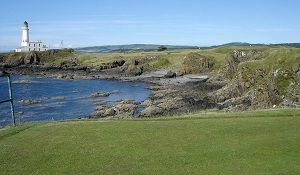 This view is of the Ailsa course 245-yard par 3 ninth. This hole was changed in 2016 from a par 4 to a par 3. Is this the top par 3 in the world? The back tee requires a carry of about 200 yards to clear the cliffs. The lighthouse is built on the ruins of Turnberry Castle, birthplace of Scotland's most famous king (Robert the Bruce). 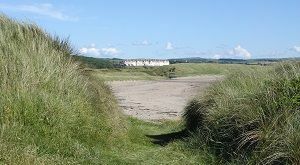 Right is a view of Turnberry beach looking towards the hotel. This one mile long sandy beach, that runs alongside the golf course, is seldom used. Other holes changed in 2016 were the 10th to a par 5, and 11th par 3 by the sea. 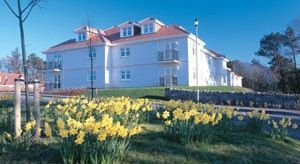 The 4 Star B&B, Links Lodge, is situated beside Turnberry golf course with panoramic views over the Clyde to the Isle of Arran and Ailsa Craig. 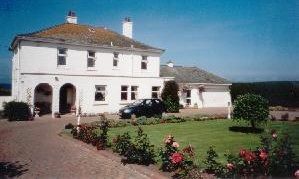 Turnberry Hotel is only a short walk from the lodge and Culzean Castle & Country Park four miles north. Tel: 01655 331 546. The 4 Star luxury self contained apartments of the Turnberry Links Estate are only a short walk from the hotel and golf complex.